The Toronto Maple Leafs lost eight games in a row to round out the month of March. April came in like a bit of a cure: the Leafs beat Calgary and Boston this past week before last night’s loss to Winnipeg appeared to kill their playoff hopes. The following anthology of disappointment is a composite of quotes from the month that was, culled from newspapers local and national, wire reports, and the Twitter feeds of a scattering of discouraged beat reporters. Losing the game was one thing, built on ill-timed mistakes and mental lapses. But why the lacklustre Leafs couldn’t match the intensity of a team outside the playoff race left goaltender James Reimer and others grasping for answers. “Why are we losing? It’s different reasons all the time. If it was one thing we would correct it,” said Joffrey Lupul. 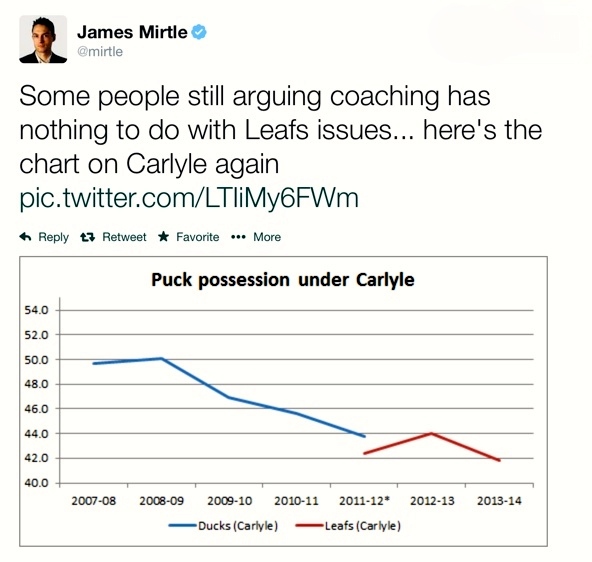 “We could not make two passes,” Carlyle said. They looked like a team that had been beaten and given up, a dead team skating, both that night and again in practice early in the week. The Leafs were off Sunday but in the dressing room the previous evening the atmosphere skewed toward stunned disbelief, a what-the-hell-happened, rather than gall or even genuine self-recrimination. Playing for their playoff lives, the Leafs pulled ahead with two goals early in the third period in what became a 3-2 win over a green Flames team, finally ending the agony of a season-killing eight-game losing streak. The win boosts their faint playoff hopes to an 8.6 per cent chance, with a pivotal meeting with the Boston Bruins looming large on Thursday. “We seem to find ways to always wonder, ‘what the heck is going on?’” said head coach Randy Carlyle, who sounded like a man who knows he will not be returning next season. “Why? What’s going on there? Why are we reacting in that manner? Everyone surveyed said Phaneuf’s hockey sense is not the greatest, that he makes too many mistakes for someone who has been in the NHL for 10 seasons. The Leafs have two glaring systemic issues, with their play in their own zone one of them and their play with leads the other. Toronto is dead last in the league with 2,800 shots allowed this season, a near-record pace that speaks to just how poor their possession and defensive game has become. Some of this is personnel, but a lot rests with the coaching staff, who have been unable to reverse the trend all season. Said this several times, but for the fans, in long run, this is better for the franchise. Leafs are under the illusion this team is decent. “I thought we were going to come back at the end, but we made a mistake,” Gardiner said. “Not a lot of space out on the ice,” Toronto coach Randy Carlyle said. This loss, which winger Mason Raymond said “stings” and captain Dion Phaneuf called “disappointing,” didn’t help that cause. I see Ron Wilson still blaming Leafs problems on fact “everything is always out of perspective” in Toronto. What a bunch of hooey. Leafs playoff chances up to 12%. Good night on the whole. Big one tomorrow vs Jets. Very tame response from ACC crowd so far. Leafs outclassed by Jets for most of the night and only scattered boos. This was not a loss. This was a public humiliation. Against a team that had already been eliminated from the playoffs, the Leafs played one of their worst games of the season. They were outshot, outworked, outplayed. Call it Fan Depreciation Night, a maddening display of their various foibles, a microcosm of the 2013-4 season. The easy thing to do is fire Randy Carlyle. It’s expedient. It’s convenient. It provides Maple Leafs fans with the pound of flesh they are already clamouring for and will be demanding at the end of this disastrous run. But is it the right thing to do? Leafs are on pace to finish with 87 points this season, and it’s mystifying how they got that many.